Trumpeter is an internationally recognized injection molded plastic model kit manufacturer that produces unique subjects of excellent detail and quality. 6 highly detailed 1/700 scale model aircraft. Molded in clear to enable an accurate clear canopy. This finely detailed plastic model kit requires minor assembly and painting. Trumpeter is an internationally recognized injection molded plastic model kit manufacturer that produces unique subjects of excellent detail and quality. Highly detailed 1/700 scale model aircraft. Suitable for use with Cold War era US Navy aircraft carriers. Molded in clear to enable an accurate clear canopy. This finely detailed plastic model kit requires minor assembly and painting. 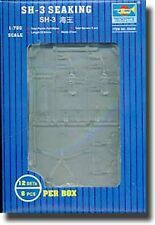 Trumpeter is an internationally recognized injection molded plastic model kit manufacturer that produces unique subjects of excellent detail and quality. Highly detailed 1/700 scale model aircraft. Suitable for use with modern US Navy aircraft carriers. Molded in clear to enable an accurate clear canopy. This finely detailed plastic model kit requires minor assembly and painting. Kit# 5790 ON SALE! LIST PRICE: 29.95 USD. Highly detailed plastic pieces molded in grey and dark red. Photo-etched parts. Trumpeter is an internationally recognized injection molded plastic model kit manufacturer that produces unique subjects of excellent detail and quality. This finely detailed plastic model kit requires assembly and painting. Item No 05713. The Admiral Kuznetsov was launched in 1985. She is the only aircraft carrier in the Russian Navy. 1/700 Russian Navy Admiral Kuznetsov. From Trumpeter Scale 1:700. Bar Code 6922803657134. 465 pieces, 360mm long, 49 mm wide. With Stand. Trumpeter is an internationally recognized injection molded plastic model kit manufacturer that produces unique subjects of excellent detail and quality. Eighteen highly detailed 1/700 scale model aircraft. Suitable for use with World War II U.S. Navy warships. Molded in clear to enable an accurate clear canopy. This finely detailed plastic model kit requires minor assembly and painting. Trumpeter is an internationally recognized injection molded plastic model kit manufacturer that produces unique subjects of excellent detail and quality. Six highly detailed 1/700 scale model aircraft. Suitable for use with World War II U.S. Navy warships. Molded in clear to enable an accurate clear canopy. This finely detailed plastic model kit requires minor assembly and painting. Trumpeter is an internationally recognized injection molded plastic model kit manufacturer that produces unique subjects of excellent detail and quality. Fully detailed static display model, which can be built either. As a waterline version or full hull version. Detailed twin aircraft cranes. Separately molded broad transom. OS2U float planes and boats. Intricately detailed deck, island and other superstructure. Accurate decal markings. Display stand. Illustrated assembly guide. This finely detailed plastic model kit requires assembly and painting. 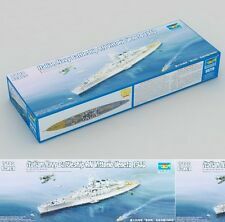 Trumpeter 1:700 USS Essex CV-9 Carrier Plastic Model Kit 05728. Has a plastic stand. 606 pieces. 378.7 mm long and 59.8 mm wide. She served in the First World War as part of the Grand Fleet, and participated in the inconclusive Action of 19 August 1916. Her service during the war generally consisted of routine patrols and training in the North Sea. Trumpeter is an internationally recognized injection molded plastic model kit manufacturer that produces unique subjects of excellent detail and quality. Trumpeter is an internationally recognized injection molded plastic model kit manufacturer that produces unique subjects of excellent detail and quality! USS New Jersey (BB-62) ('Big J' or 'Black Dragon') is an Iowa-class battleship, and was the second ship of the United States Navy to be named after the US state of New Jersey. New Jersey earned more battle stars for combat actions than the other three completed Iowa-class battleships, and was the only US battleship providing gunfire support during the Vietnam War. This finely detailed plastic model kit requires assembly and painting. This is a new in the box. FREE Trial! Trumpeter is an internationally recognized injection molded plastic model kit manufacturer that produces unique subjects of excellent detail and quality. Eighteen highly detailed 1/700 scale model aircraft. Molded in clear to enable an accurate clear canopy. This finely detailed plastic model kit requires minor assembly and painting. Trumpeter is an internationally recognized injection molded plastic model kit manufacturer that produces unique subjects of excellent detail and quality! USS Iowa (BB-61) is a retired battleship, the lead ship of her class, and the fourth in the United States Navy to be named after the state of Iowa. Owing to the cancellation of the Montana-class battleships, Iowa is the last lead ship of any class of United States battleships and was the only ship of her class to have served in the Atlantic Ocean during World War II. This finely detailed plastic model kit requires assembly and painting. All of the models are either new with plastic wrap, new without plastic wrap or opened box. You will be getting the model pictured. Trumpeter is an internationally recognized injection molded plastic model kit manufacturer that produces unique subjects of excellent detail and quality! USS Mount Whitney (LCC/JCC 20) is a Blue Ridge-class command ship of the United States Navy; it is the flagship of the United States Sixth Fleet. She is also the command and control ship for the Commander Joint Command Lisbon and the Commander Striking Force NATO. She had previously served for years as the COMSTRIKFLTLANT(NATO Designation) / US Second Fleet's command ship. This finely detailed plastic model kit requires assembly and painting. Trumpeter is an internationally recognized injection molded plastic model kit manufacturer that produces unique subjects of excellent detail and quality. One-piece slide-molded upper hull; lower hull made from two-directional slide molds. 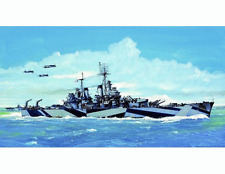 This is a Trumpeter 1/700 HMS Eskimo British Tribal Class Destroyer 1941. Trumpeter is an internationally recognized injection molded plastic model kit manufacturer that produces unique subjects of excellent detail and quality. Highly detailed 1/700 scale model aircraft. Suitable for use with World War II US Navy warships. Molded in clear to enable an accurate clear canopy. This finely detailed plastic model kit requires minor assembly and painting. German Prinz Eugen Heavy Cruiser. This is a new Trumpeter Models kit #5767. 1/700 Scale. Trumpeter Models. This is a 1:700 scale model requiring assembly and painting. I will not alter the import declaration.